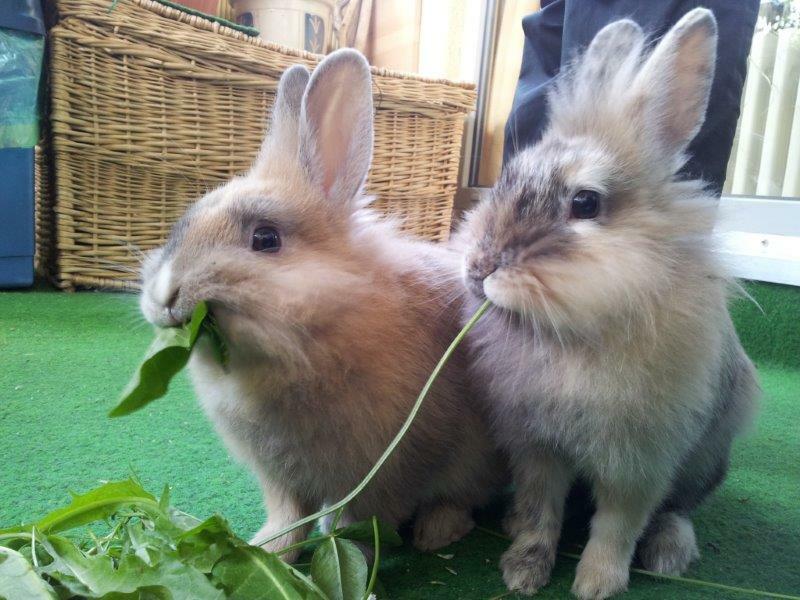 Home » Rabbit Pics » Adorable Bunnies with Food! 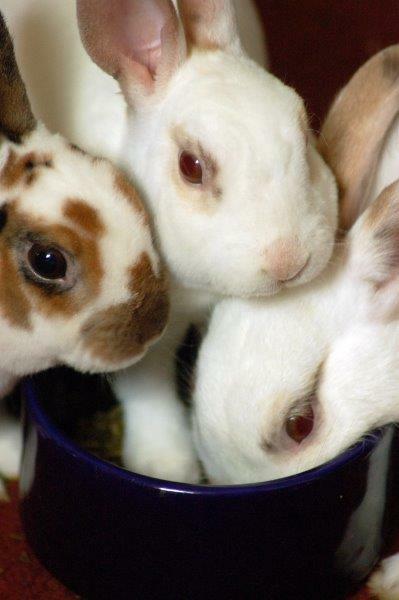 These three little kits are probably some of the cutest bunnies you will find on Bunnyopia! These guys are sharing a leaf of romaine lettuce. Make sure to avoid lighter kinds of lettuce as they have a high water content and not much nutritional value. 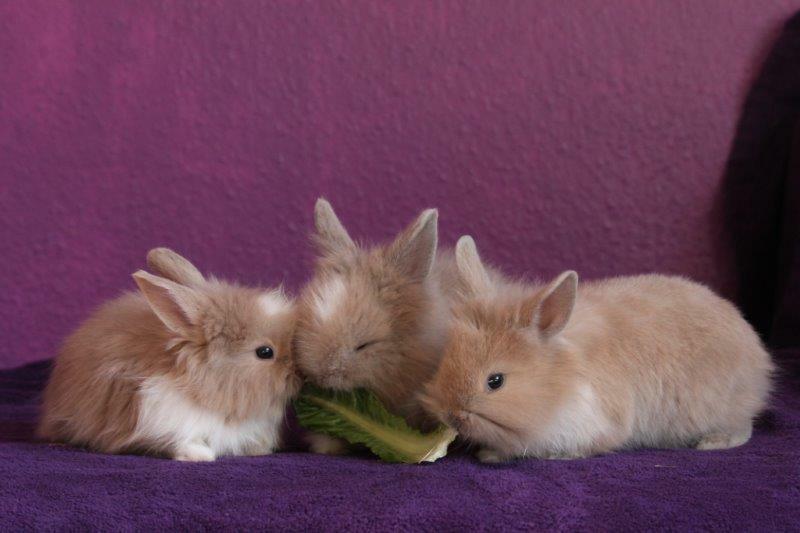 This tiny bun in the middle looks like he can’t get enough though! 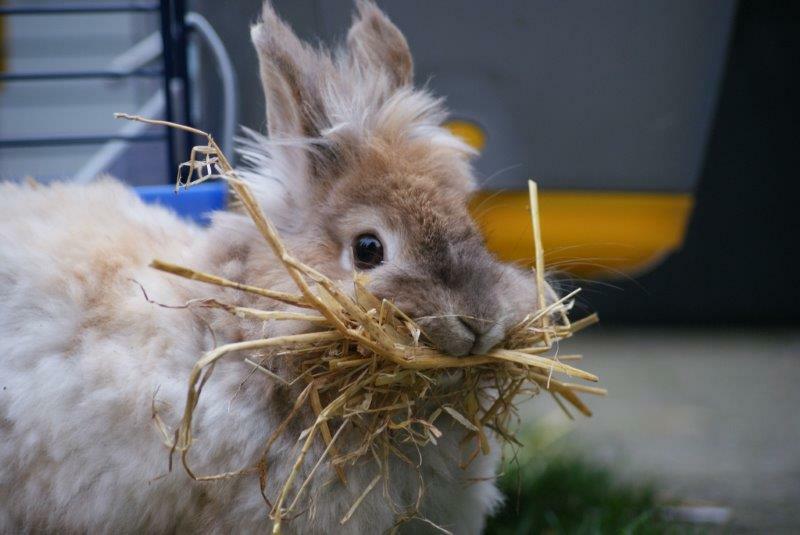 This cute bun is Ovide – he absolutely loves as much hay as he can get! It is important that hay makes up at least 80% of rabbit’s diets, this is because their tums don’t work the same as ours. If not enough hay is eaten this can actually cause blockages which can be very bad. 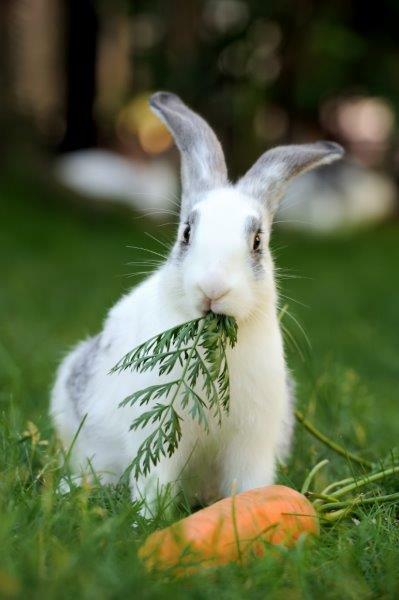 If you want to know more about this, and other rabbit diet questions – see our post here. This is All Food Right? 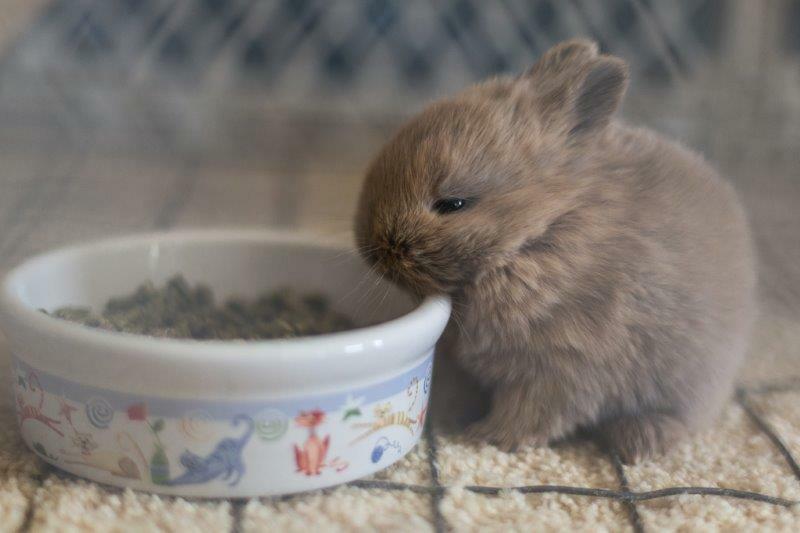 This tiny baby bun looks a bit confused. She’s unsure whether she’s allowed to eat her dad’s plants on her first trip outside into the garden! This tiny bunny isn’t quite big enough to reach his pellets – we think he looks a bit sad about it… Baby bunnies need more protein to help them grow. Luckily most food producers also make “junior” versions of their food to help with this. 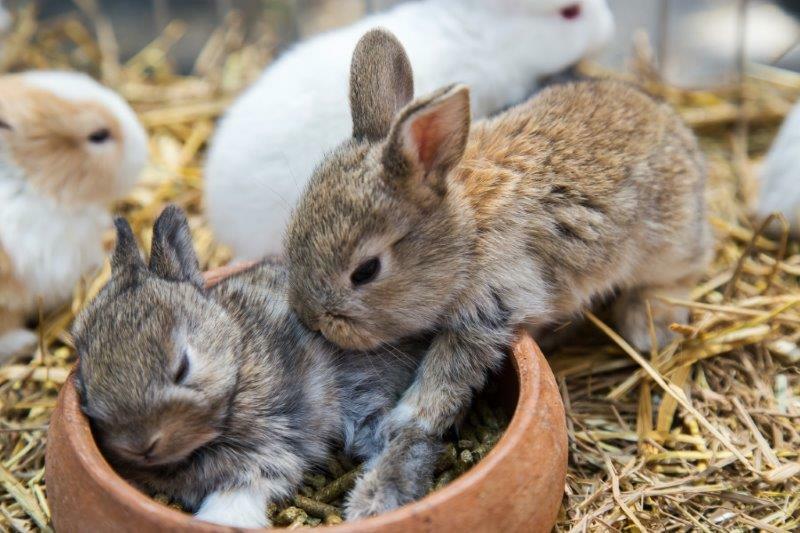 If you love this photo you’ll love our collection of cute baby bunny photos here. 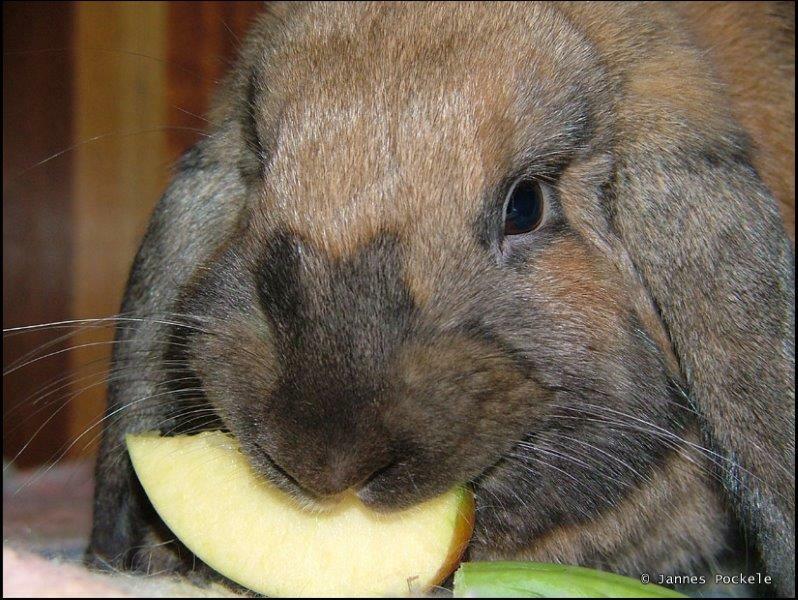 This cute lop bunny is Knuisje – he really loves apple! Apples are high in many nutriuens which can help you bun’s health. However, experts recommend to give sugary fruits as occasional treats only. Unfortunately this kit’s rabbit mum refused to care for her litter. 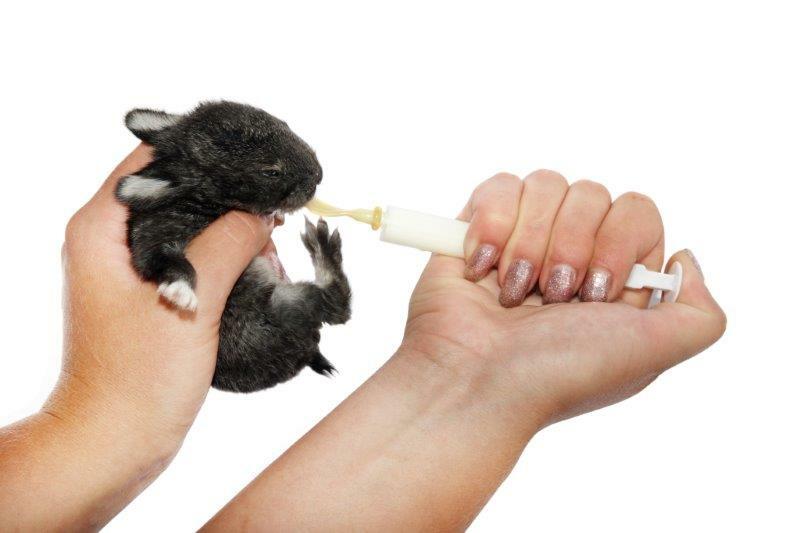 Luckily this caring bunny loving owner decided that she would nurse the tiny buns herself. The clever owner of this cute rabbit decided to invent a new game. Instead of just giving their bun their carrot they decided to “plant” it in the garden for him to investigate. 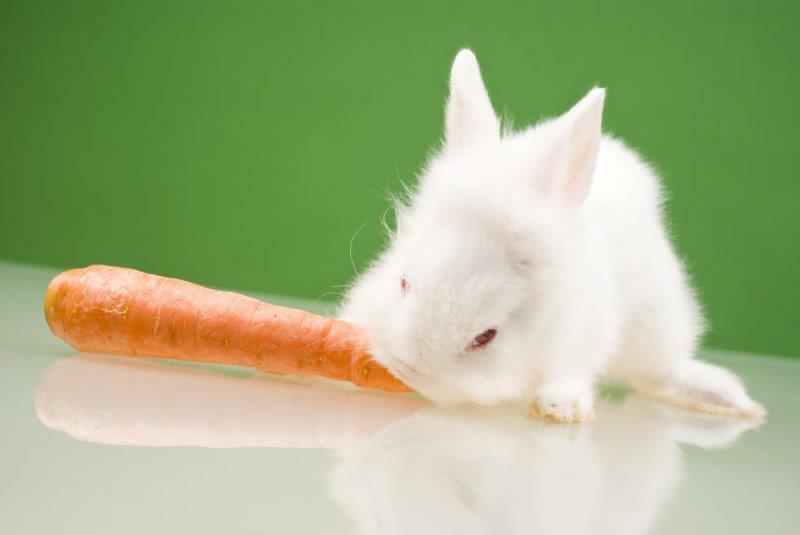 It’s a really good idea to make feeding your bunny more interesting like this – why not try this idea? And here he is looking happy with himself after pulling the carrot out…. These three cuties are Millie, James, and Patches. It looks like Millie is trying to claim the pellets for herself – but it’s not working very well. The paw in the food trick is something every bunny owner knows. If you love seeing rabbits play with their best friends you can find our collection of the 35 Cutest Rabbit Friends photos here. 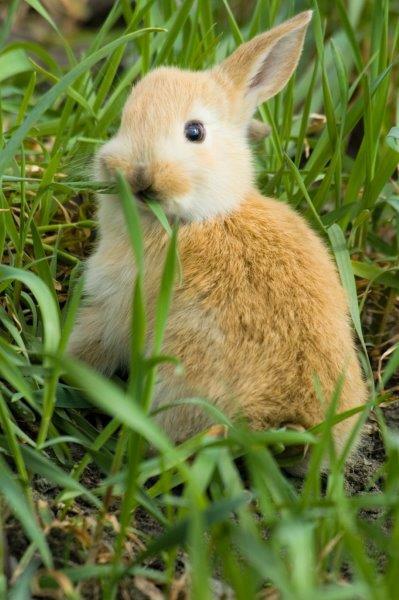 This wild bunny looks like he’s been caught doing something he shouldn’t! 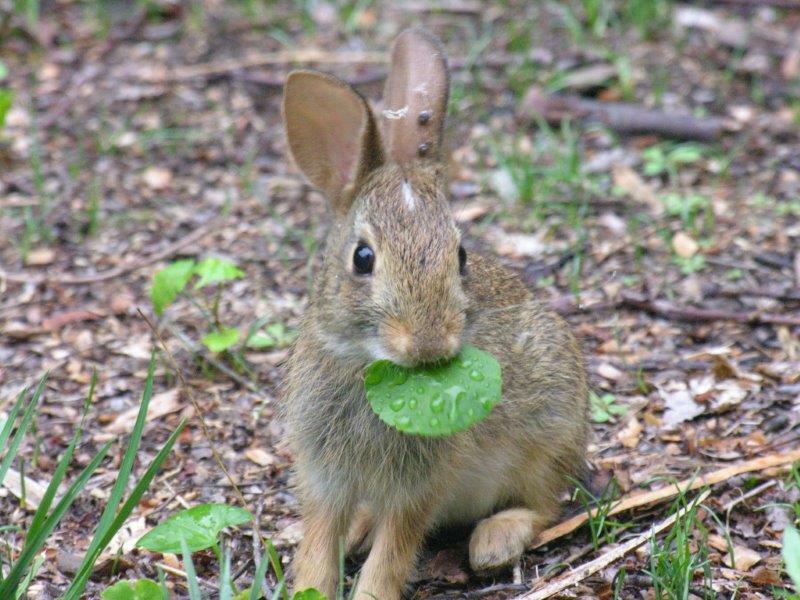 That’s definitely not true though, leaves are very good for rabbits. 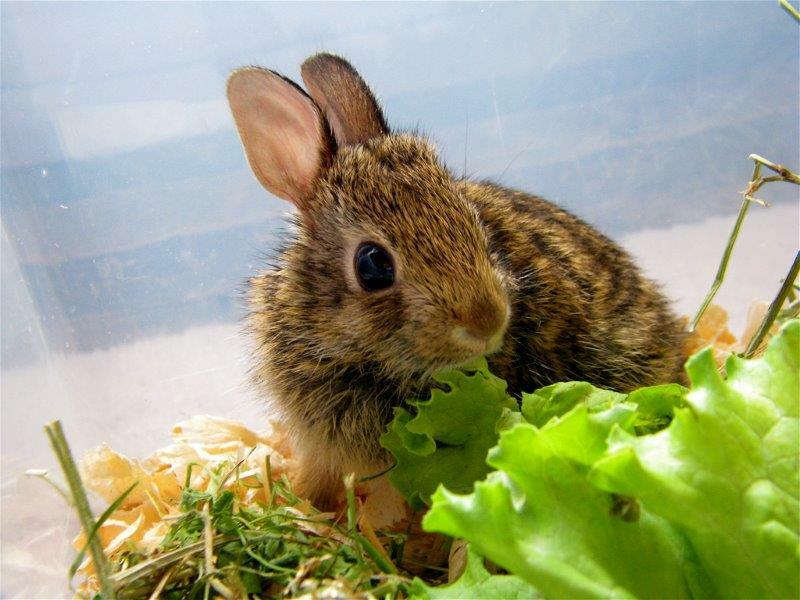 We should try to copy wild rabbit’s diets where possible to improve our bun’s health. 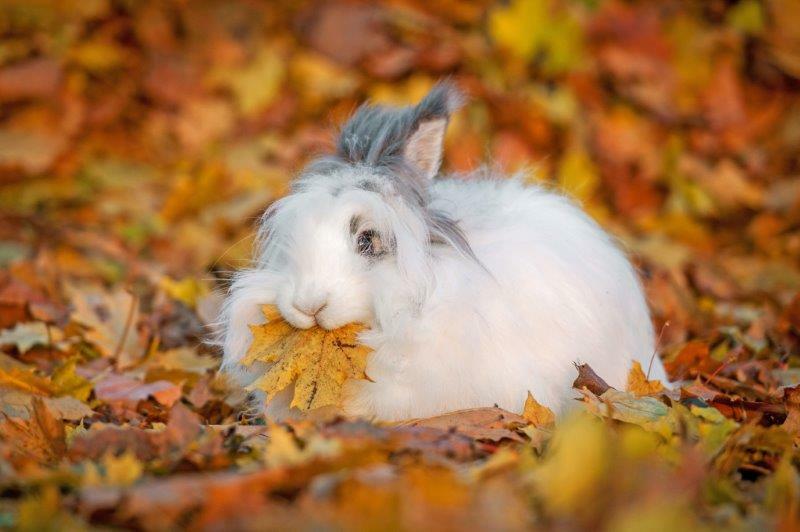 This cute angora rabbit is Alex – he loves playing (and eating) in the Autumn leaves. His owner does get cross that he gets so many stuck in his long fur though! 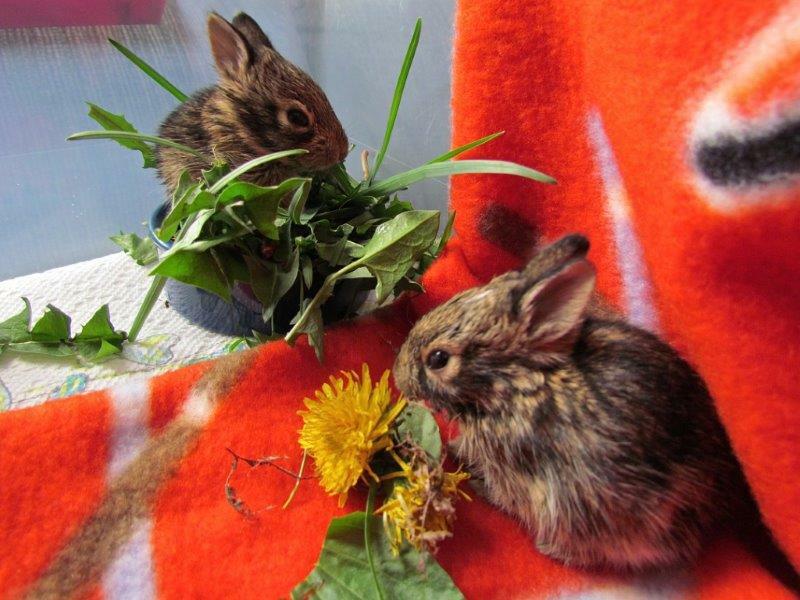 This caring bunny owner takes the time to nurse abandoned wild rabbits she finds. Here are two of her latest patients. 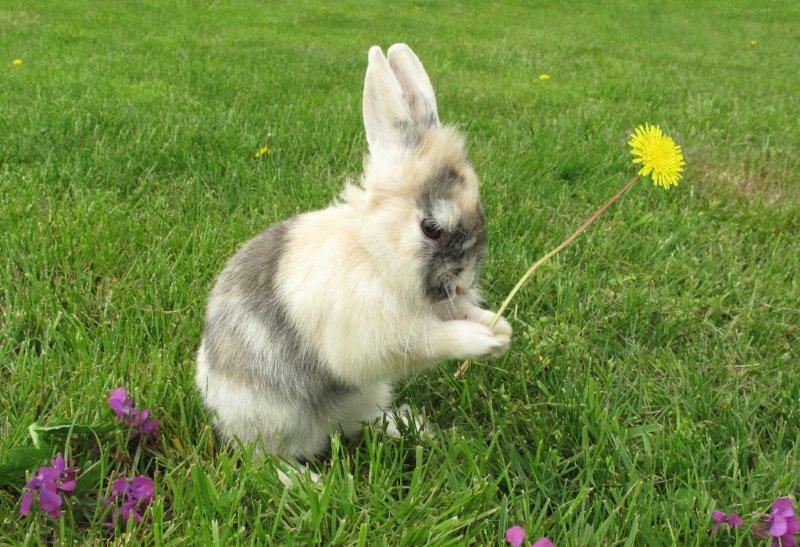 Dandelions are an incredibly nutritious food source for rabbits – and they love them! This fluffy bun is Pete. He has eaten so much hay he needs a bit of a human nap! Any fluffy bunny owner will tell you that although it’s very cute when they get hay in their fur around their mouth it’s not so fun brushing it out! 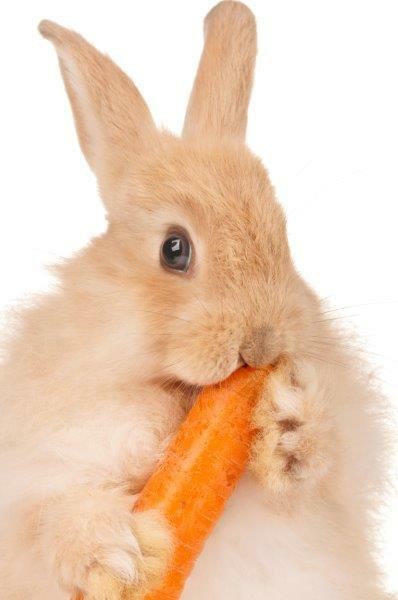 This cute contented bunny couldn’t eat his nice fresh carrots quickly enough! 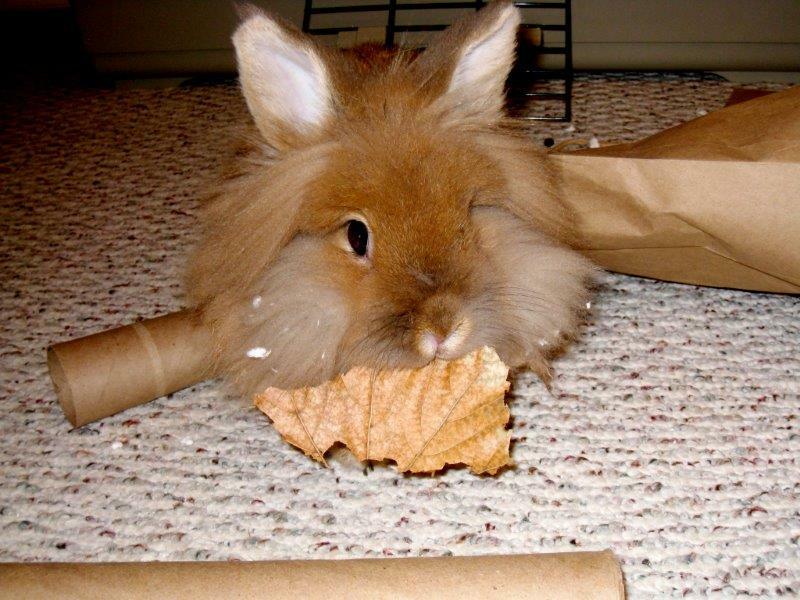 A leaf for main course, toilet tube cardboard for dessert! Jeremy is going back to his wild roots here! 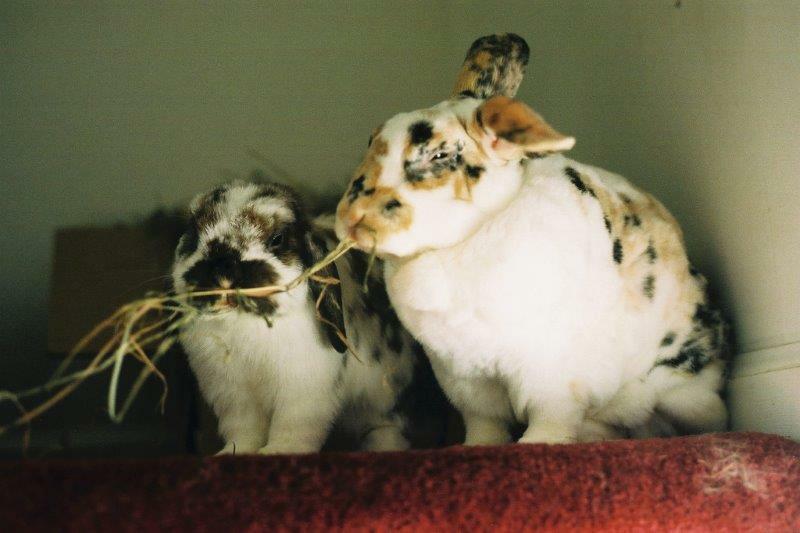 Grass is a staple food for wild rabbits. Since we like to keep our buns safe and warm (i.e. normally away from growing grass) we need to make sure that this is replaced with plenty of fresh hay. These cute buns are Paisley and Dora. Paisley doesn’t look very happy about being snapped while they’re tucking into a big pile of hay! This is just like the classic scene from Lady and the Tramp! 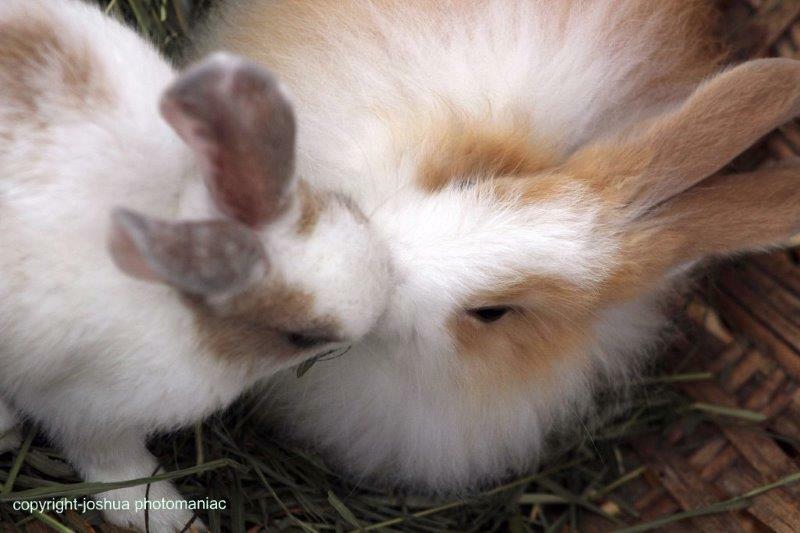 Their eyes met over a shared piece of hay… Rabbits definitely wouldn’t like meatballs though! 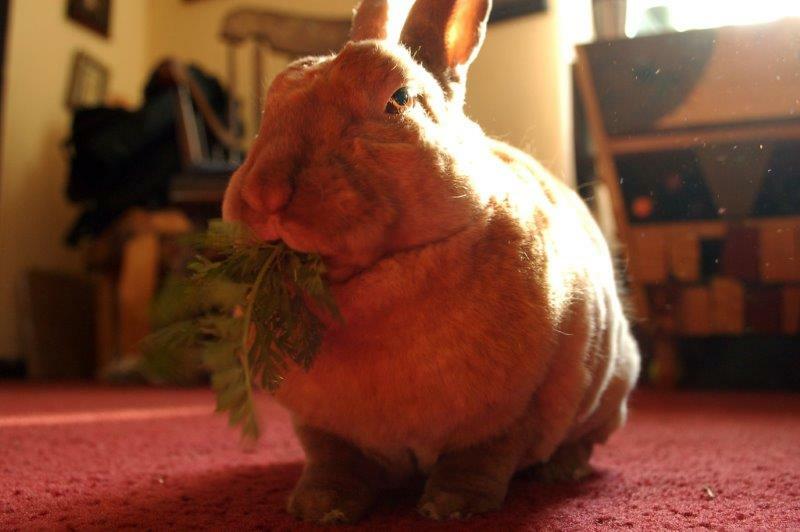 This bun looks like he’s loving his carrot – although it is the size of him! 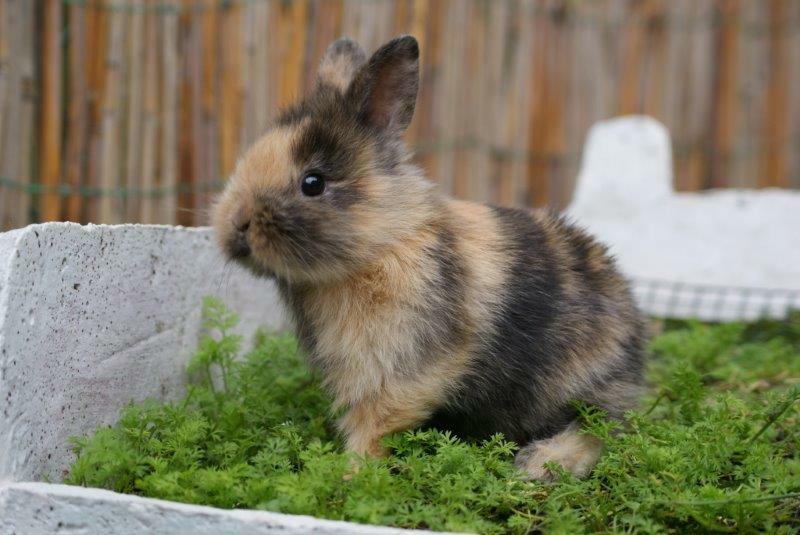 This little wild rabbit was named Hoppity by his carers. He was found abandoned by some kind people who fed him up until he was ready to be released into the wild again on his own. Here are two more bunny best friends sharing their evening meal. It must be love! It’s great to add parsley and other herbs to your bun’s diet. Not only do they count towards their daily veggies but some also have other beneficial properties. 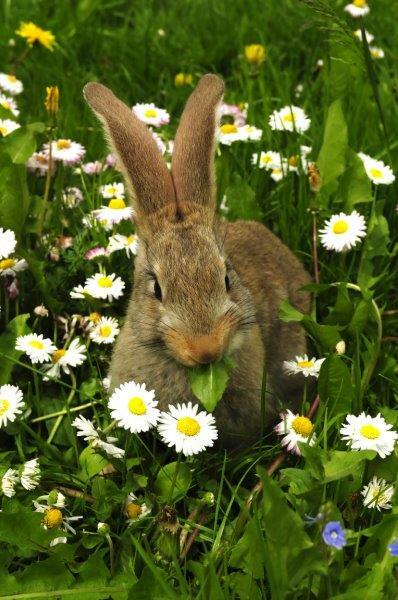 For example it can help your bun’s immune system with its high levels of vitamin C and B12. 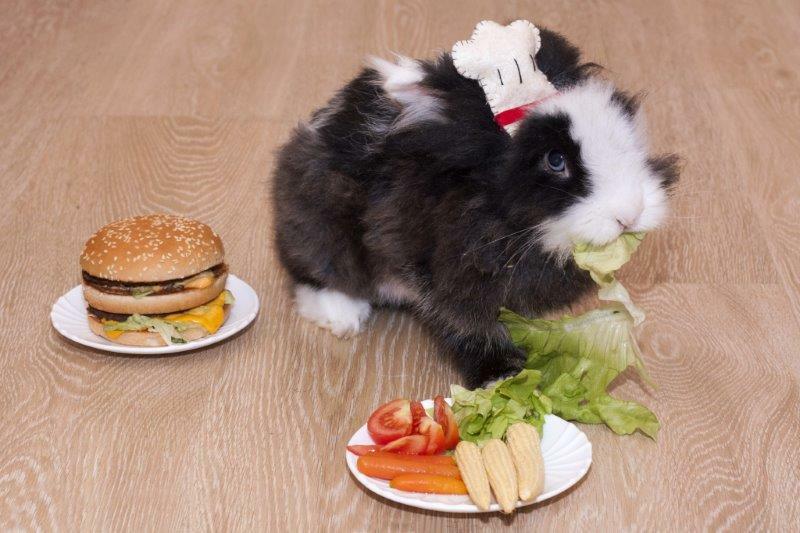 Given the choice between a nice tasty (for a human) burger and veggies rabbits would choose veggies every time! This left Scruff’s owner to enjoy their burger lunch. Freddie looks like he’s praying for more dandelions to appear from the sky! 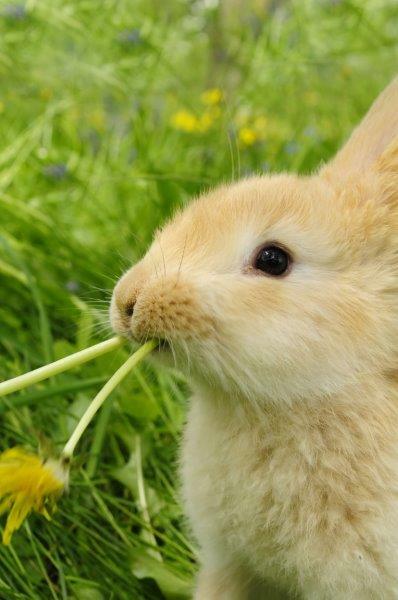 Rabbits absolutely love dandelions and they also happen to be very nutritious for them. They contain a lot of protein but are low in fiber so they cannot be used as a substitute for lots of fresh hay. Trying to Eat Mum’s Tulips! 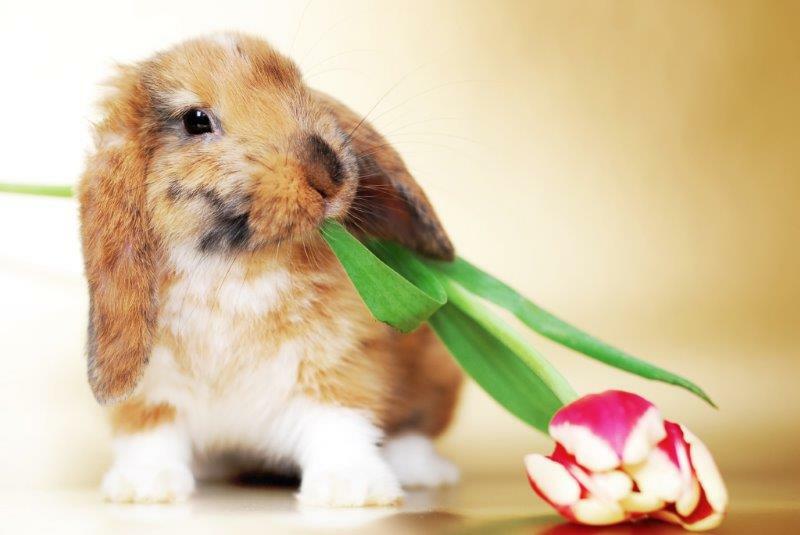 Luckily this rabbit’s owner caught Butterscotch in the act of stealing her tulips. Tulips aren’t actually bad for rabbits (tulip bulbs are however) so Butterscotch was fine. Now her mum keeps flowers well away from her though! This guy really thinks he’s Buggs Bunny! This is a glimpse of rabbit heaven right here. I like to think this is what rabbits dream about. 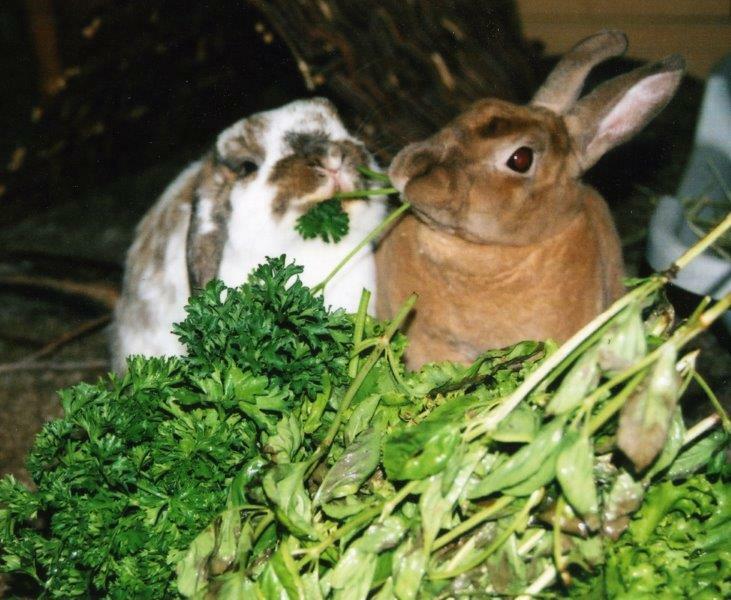 There’s nothing rabbits like more than to share a big pile of greens with their favorite friend. Here are two of the cutest bunnies ever proving just that. 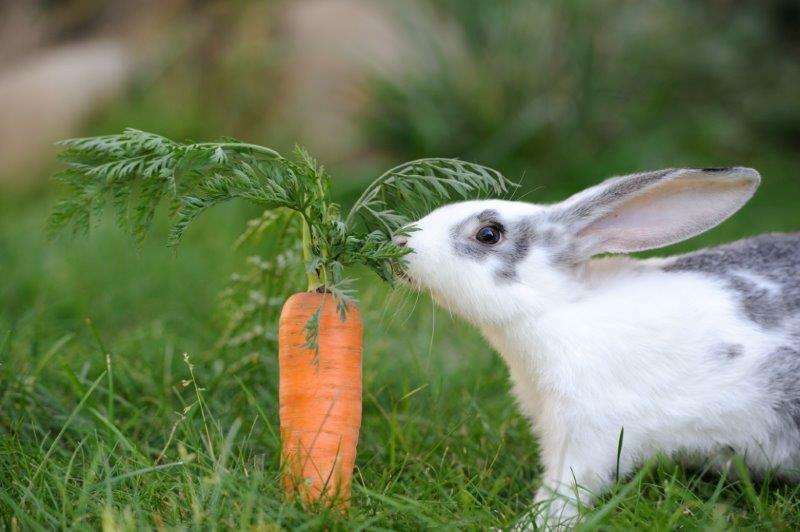 Here’s one way to weed your garden – get your cute bunny friend to do it! Always make sure to supervise them though if your garden isn’t bunny proofed. 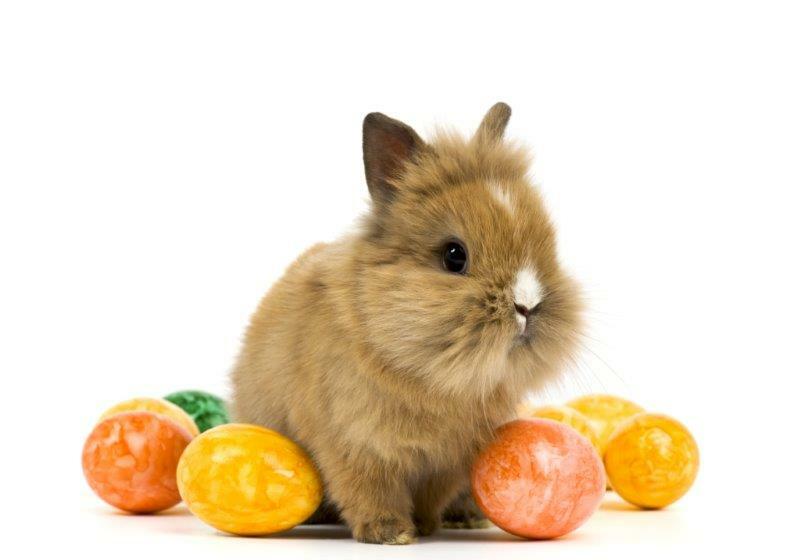 As we have mentioned elsewhere fruit should be a small portion of your bunny friend’s diet. 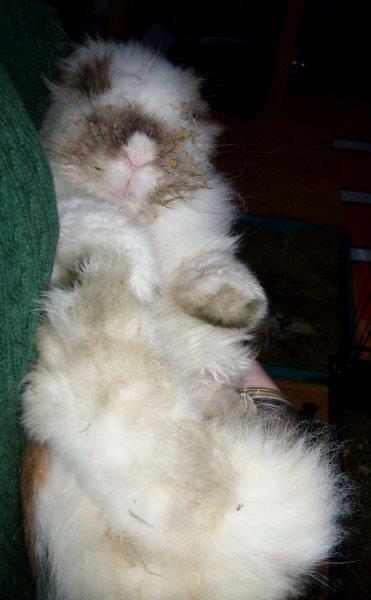 We’re sure Fluffy’s owner here hasn’t given her the whole box full – she does love them though.